Now imagine this scene occurs not in an open field, but in an arena filled with hundreds, perhaps thousands, of cheering fans; and the puppy is not a dog, but an animal sometimes referred to as a “doggie” – a baby calf. 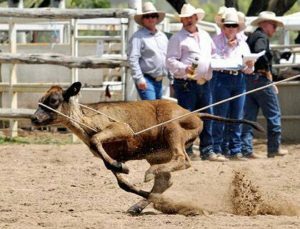 When these actions are taken against a puppy or kitten the offender is charged with a felony and jailed; but at a rodeo these actions are applauded and cheered. Rodeo is unlike any other professional sport. It emerged from the boredom of poorly paid, uneducated ranch hands transporting animals across long, lonely distances – from ranch to slaughterhouse. Much of that lifestyle has been replaced by well paid, educated truckers today; begging the question – what keeps rodeo alive? Rodeo is a relic from a time when bored cowboys were trying to kill time. They did this by developing competitions that brutalized defenseless animals. 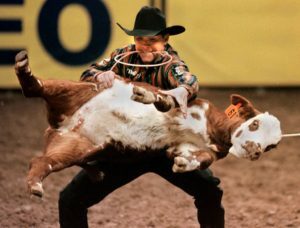 Rodeo is, and has always been bad for animals and is nothing less than legalized animal abuse. 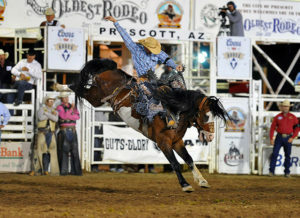 Calf Roping: a mounted rider yanks a calf into the air by her neck, slams her into the ground, and ties her legs together. During this performance, calves may cry out (if they can breathe), defecate from fear and stress, and suffer neck injuries and death. Steer Busting: a rider ropes a steer with such force that the steer flips in the air. The injury and death rates are so high that the Nevada State Veterinarian has condemned the practice. 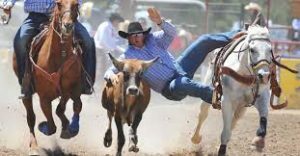 Steer Wrestling: in this event the steer endures a high level of stress and can suffer ripped tendons, sprains and bruising, and even a broken neck. Bull Riding and Saddle Bronc Riding: bucking straps, electric prods, and spurs are used to hurt the animal and aggravate him into reacting more roughly than he would naturally. To provoke the animals into appearing more aggressive than they actually are rodeos use a variety of tools to cruelly provoke them. Tools, like an electric prod called a “hotshot”, that is used on an animal while trapped and helpless in the chute. The intense pain scares the animal into displaying abnormally dramatic reactions. Other tools include metal spurs and “bucking straps” that are intentionally applied so tightly they burn the animal’s abdomen and groin area and cause him to “buck” wildly. These tools are known to cause back and leg injuries in the animal. 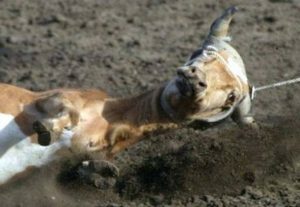 Rodeos are a constant source of pain and stress for animals forced to participate. They suffer broken ribs, backs, and legs, torn tails, punctured lungs, internal organ damage, ripped tendons, torn ligaments, snapped necks, and agonizing deaths. 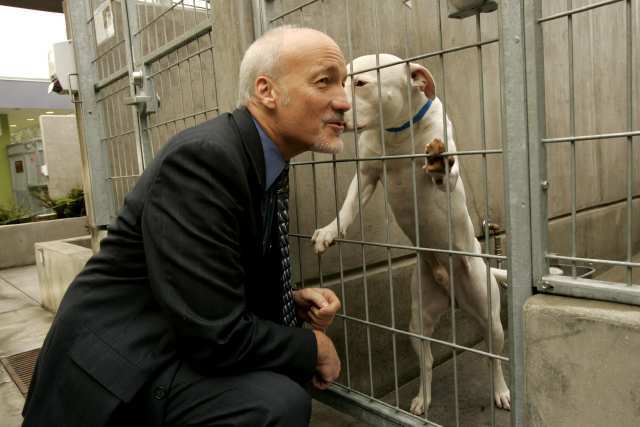 While it’s all theater for the cowboys and the audience; it’s all torment for the animals. 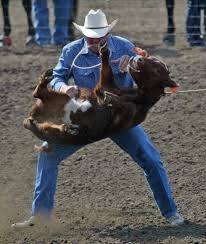 The animals are physically and deliberately provoked to make cowboys appear more impressive than they really are – while the suffering the animals endure is carefully hidden from ticket buyers for fear they will stop subsidizing this state sanctioned animal abuse. The fabled cowboy rides high in our culture, the heroic symbol of American independence and self-reliance exalted through two ongoing, albeit antithetical, institutions: cerebral cowboy art and a cruel rodeo. We all love our Western heritage; but do we really need to abuse animals to stay in touch with our past?